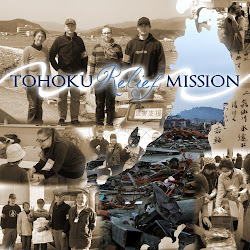 Tohoku Relief Mission: Christmas in Minami Sanriku! With the onset of winter in earnest, the temperatures in this part of the Tohoku region have begun to drop below freezing. The tsunami victims have all been moved from shelters to temporary housing units, but this has brought new issues to the fore. Aside from the obvious discomfort of living in cramped, badly insulated prefabs, mental and emotional stress has become a bigger problem. The aged and infirm have difficulty getting around, and there are little or no services left in the town. The once tight knit communities have been scattered, as the relocation process didn’t generally take into account the victims’ original place of residence. The colder it gets, the less inclined people are to go out of doors. There are already reports of elderly victims dying alone and forgotten, and mental illness is on the rise. To address some of these needs, we have started a project of organizing community events for different municipalities where the temporary housing units have been built. The first was held on December 18th at Numata Municipality in Minamisanrikucho. Volunteers came from all over the country came to help out, and Christmas was in the air! After a slightly harrowing drive through snowy mountains in the wee hours of the morning, our team arrived and the fun began. 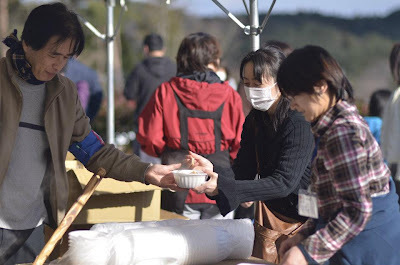 Shimonaka san came all the way from Hyogo prefecture, along with other members of Rainbow Hearts from Saitama and Chiba, to serve hot meals to all those who attended the event. Mike Kawashima dressed as a clown made balloons for kids (and some childish adults) for hours, which was quite the hit. 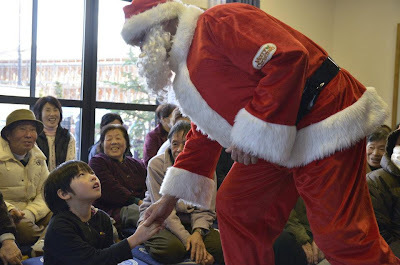 And the highlight of course was Santa Claus with sponsored gifts for everyone! We were also able to give out nearly 100 Mottos for Successcalendars that were sent by Activated Ministries as Christmas gifts. This is Florence with Mr. Watanabe, the caretaker of the building that we used for the event. He later explained to us that the victims have difficulty organizing events for themselves, as they have been resettled here from places all over the city and hardly know their own neighbors. As one of the original residents of this neighborhood, he and a few others had been trying to help them to rebuild their community, and they were so happy that we had organized this Christmas event for that purpose. Our whole team, along with some of the local people who helped to organize the event. Many thanks to the TFI Shizuoka, Raindow Hearts, TFI Noda, AINOTE volunteer network, BANDAID, MiA, and all the other volunteers who made the event possible. Thank you also to Activated Ministries and TFI members in Shizuoka and Noda who helped to cover the transportation and other costs.